1. Preheat the oven to 200°C, gas mark 6. Place the butter, parsley, brandy, Dijon, garlic, shallot and nutmeg in a small bowl food processor and pulse until chopped. Scrape onto some baking parchment and roll into a cylinder, then place in the fridge to harden and infuse with flavour overnight. 2. Peel the mushrooms and place on a baking sheet. Toss the breadcrumbs in the olive oil then scatter over the mushrooms and dot with two thirds of the butter. Season well. 10 minutes until juicy and tender. Heat the remaining butter in a small saucepan. 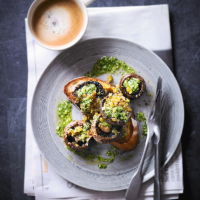 Serve the mushrooms on the toast and drizzle with the remaining warmed butter.